If you’re new to the newsletter, you can check out past editions here. Everyone else, welcome back! Before Birchbox, I worked at Condé Nast Traveler, where I thought a lot about how to get the most out of travel. My editor tendencies have stuck—lots of research, planning, and wandering around looking for the perfect meal—but a baby does change things. In honor of upcoming holiday travel, here’s what I’ve learned about traveling with a baby. I hope it helps, and would love to hear your tips, too! Before we had Lilly, Rob and I pinky-swore each other that we’d still get out of the house for adventures small and large. We took her to brunch (a half block away) at five days, and on a mini road trip at one month. Both times were terrifying but we just held hands and jumped in—and have continued to take that approach to traveling over the past six months. She’s flown to LA, Hawaii, and Atlanta, and taken car trips to the Catskills, Maine, Montauk, and the far reaches of Bay Ridge. Listen to Grace: My friend Grace took 30 solo flights with her son Charlie before he turned one year. She is a hero, and you should read this. 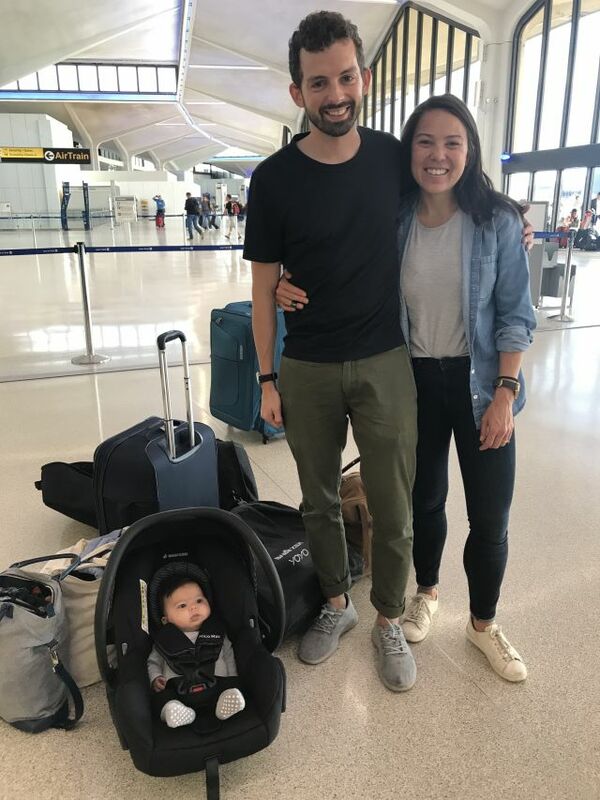 I send it to every new parent before their first trip; she’s got tips on consolidating carry-ons, breastfeeding en route, and keeping a nugget entertained through a cross-country journey. Take mini adventures: For Lilly’s one-month birthday, we popped her in the car seat and drove up to Beacon, NY to visit Dia: Beacon and Fishkill Farms. It was a nail biting hour-and-a-half but we survived, she snoozed through some Serra, and it gave us the confidence to take other trips throughout the summer. Break the seal sooner rather than later. Plan, plan, plan: One thing you can’t do with babies: Play it by ear. I’ve always been a list person but Lilly has shifted things into overdrive. I have a Google doc of basic things we need to bring with us, and I tailor it for each trip; not only does it help you strategize how many pieces you’re bringing but it also helps you avoid forgetting critical items. Pack strategically: Gone are my days of throwing things in a suitcase the morning of a flight. In addition to my handy doc, I’ve started laying everything out on the bed before carefully Kondo-folding each piece. I pack Lilly’s things with mine, either in my favorite multi-compartmented Birdling bag or a suitcase for longer trips. Take care of yourself: On our first trips I was so focused on Lilly’s things that I forgot to pack my own essentials—toiletries, underwear, snacks. Don’t forget about yourself, and I’m not kidding about the snacks. Being stuck in the backseat of a car with a screaming baby is bad enough; it’s hell if you’re hungry. I almost always bring a container of homemade trail mix, inspired by my friend Alexis. It’s dried mulberries, raw pistachios, peanuts, sunflower seeds, and pepitas. Dark chocolate chips optional. Slow your pace: Before Lilly, Rob and I would charge through the airport like Clooney in Up in the Air. No longer. You are carrying a baby and twice as much stuff. Don’t make it worse by trying to leap over rolling suitcases or dodge crowds of tourists. Adjust your airport travel times and stroll calmly. Take advantage: While you’re no longer a carry-on only family, the good news is that you can now experience the gloriousness of curbside check-in. Ditch those bags as soon as possible. At the gate, take advantage of pre-boarding so you can get settled before the flight. Ask for help: I was nervous that people would hate us for bringing a baby on a plane but from our experience, if you’re polite and self-aware, they are excited to help you. Don’t be afraid to lean on flight attendants for whatever you need—on my solo trip back from LA, I had to ask one to hold Lilly while I went to the bathroom! Find what works and stick with it: After Lilly slept the whole way from New York to Los Angeles, we’ve dressed her for subsequent flights in the same lucky plane outfit (cozy hooded sweatshirt and extra thick socks). She’s about outgrown it so we’ll have to find a new solution, but my takeaway is that it helps to keep some things consistent from trip to trip—for you and for them. On the other side of the spectrum, Lilly has a habit of melting down for at least 30 minutes of any car ride so I’ve developed a strategy of double draping her car seat and shushing her ear as loudly as I can. I’ll keep doing it until it stops working. That’s it for now! Good luck traveling this holiday, babies or no babies. Previous Previous post: Hey, it’s the holidays!